You’ve heard the question. Your realtor, your spouse, or your neighbor may have asked it. Chances are, you paused at the question, overwhelmed by the implications of a remodel on your lifestyle and your finances—and the sheer unknown that accompanies a complete upheaval of your home and its surrounding site. Luckily, there are contractors, building professionals, and interior designers in Flathead Valley who can turn that question into a declarative statement of possibility, inspiration, and excitement, and before you know it, “before” and “after” images tagged with #WeAreRemodeling will fill your social media feed. 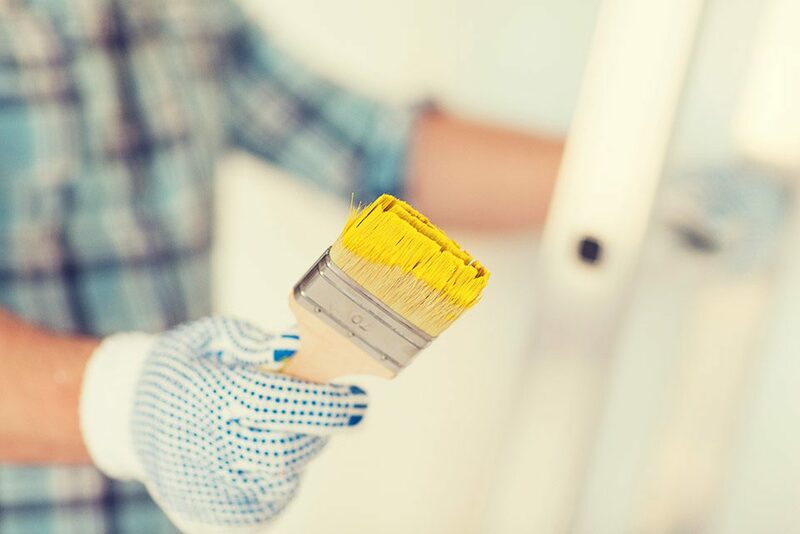 WHETHER YOU LIVE IN A SINGLE-FAMILY RESIDENCE BUILT TEN YEARS AGO OR 1980S CONDO, REMODELING YOUR ABODE HAS MANY BENEFITS. First, it will increase the market value of your home or condo and will typically contribute to the overall value in your neighborhood. Second, with new energy–efficient hard goods, like windows, siding, and appliances such as refrigerators or washers and dryers, it will decrease your carbon footprint along with your monthly bills. 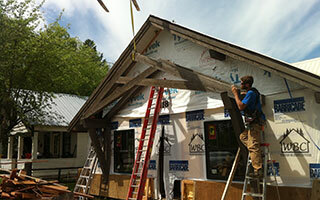 Third, a more efficient home translates to easier maintenance and fewer future problems. And, fourth, if you have different needs, as in the kids have flown the coop, what better time to reconfigure a bedroom or two into a media room, gym, or guest suite? Those are the obvious reasons, but if you want an even more convincing argument, then imagine a more spacious home with an updated style where you and your family can enjoy the comfort of a renovated space. Start dreaming because all of it is possible and it’s time to have some fun! 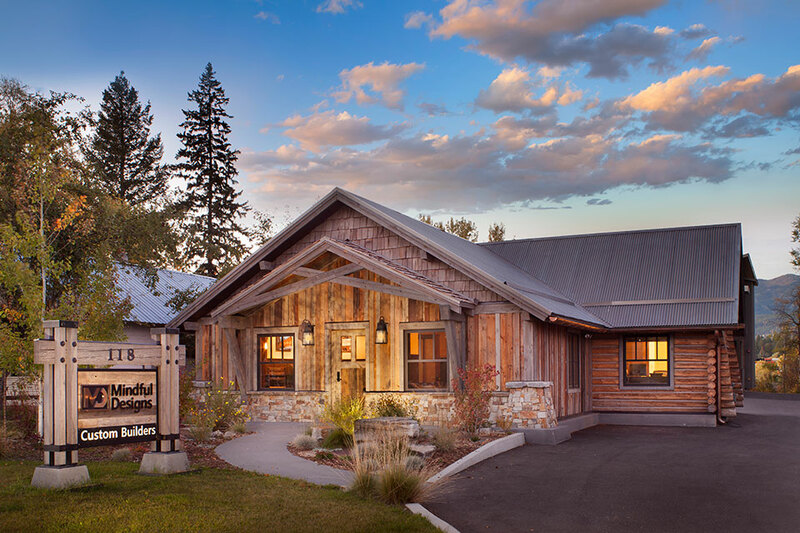 When Jason Pohlman of Mindful Designs Inc. decided it was time to remodel his log cabin office on 2nd Street in downtown Whitefish, as one of the owners along with Dave Radatti and Marty Beale, he realized the inherent benefit to property value, but as a builder he also understood the importance of identifying priorities. Every builder agrees, “When you’re getting into something old, there are going to be surprises.” Pohlman knows that from a client’s perspective, remodeling costs are significant and working within an existing footprint helps to keep costs in check. Now he was the client. 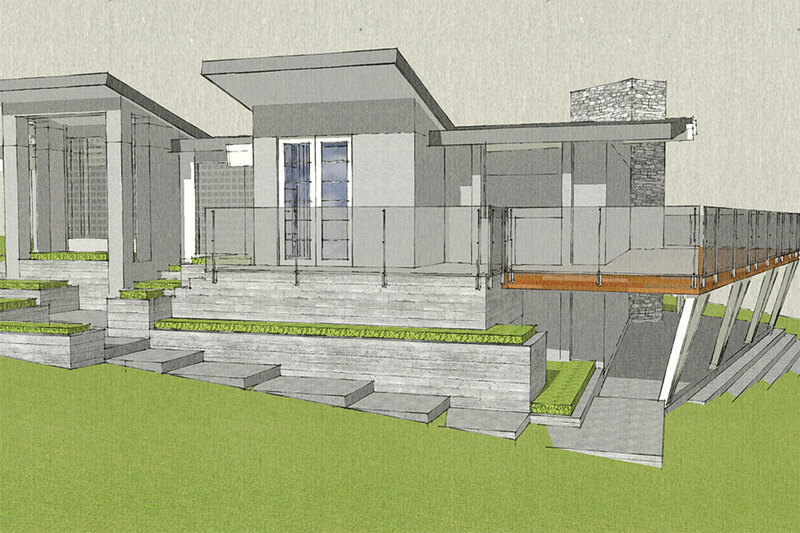 Pohlman assessed his Mindful Designs Inc. office. “There was an opportunity to open up the usable space on the second floor, but the structural elements were certainly a challenge. The roofline didn’t change, but the roof had to be reinforced significantly. In this case, the second floor offered an opportunity to improve the whole space from an energy-efficiency standpoint and to help preserve the building.” It necessitated working within parameters to account for updated heating, plumbing, and those structural changes. 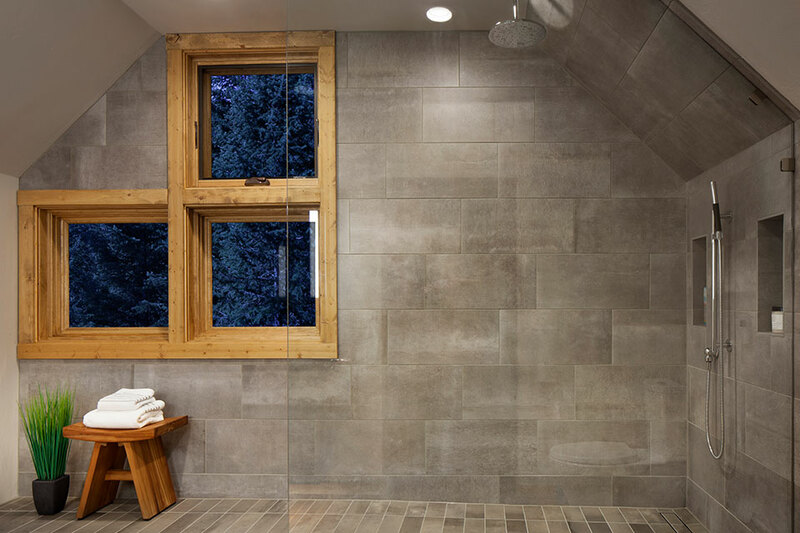 Supporting Mindful Designs Inc.’s philosophy for sustainable materials and minimizing the environmental footprint to build healthy and safe homes, Pohlman and his team kept their focus on efficiency, quality, and longevity. After a full gutting of the 100-year-old cabin, the new windows, lighting, and signage resulted in a timeless 1,200-square-foot office that retains its original hardwood floors while profiling the firm’s quality workmanship and achieving a clean, classic style. “On the tech side, lighting and home automation have recently changed, ushering in much smoother, user-friendly interfaces. Added to the list of must-haves is functional outdoor space, as well as a visual connection to the outdoors,” he continues. 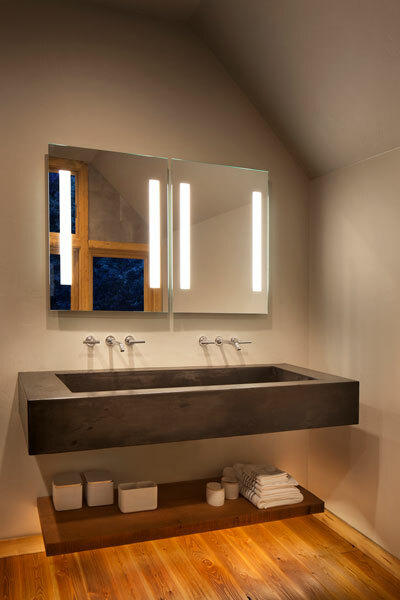 The concrete sink offers smoothness and style with its deep gray color, pleasing shape, and edge profile, and the lighted mirrors provide an elegant glow and a sculptural element to the soothing space. The remote shower valve eliminates the need for handles and knobs, and it can be programmed to control the temperature and length of time for water efficiency. The pop of green grass and bathing stool add to the sanctuary-type feel of this inviting space. In the master bedroom, Pohlman chose to keep the elements simple by combining different wood finishes to complement the flow of the angled roof and the modern sliding barn door. 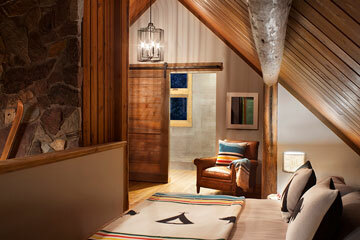 Both cozy and comforting, the space retains its openness and scale. This clutter-free, light-filled sleeping area is ripe for dreaming. When you’re feeling good about the remodeling process, it’s usually because you’ve heard a good story from a friend. 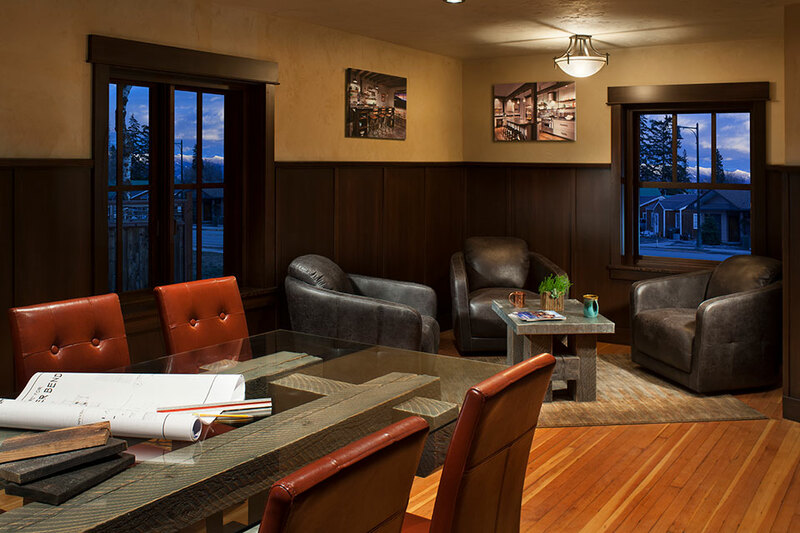 Clients from both Mindful Designs Inc. and Bigfork Builders have testimonials worth reading. Each firm cites collaboration, creativity, and craftsmanship as the cornerstones of their business, reputation, and lifestyles. For Brad Reedstrom and Andrew Fischer, partners at Bigfork Builders, their lake remodel project at Finley Point began last summer. 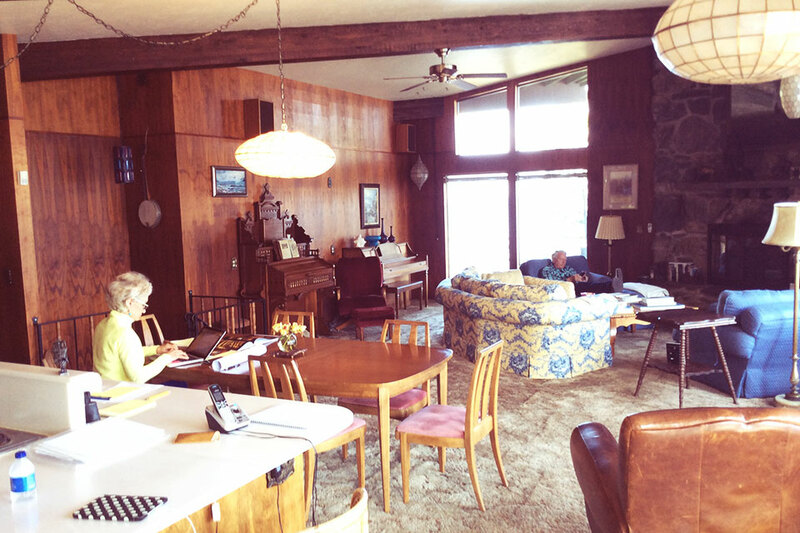 It’s the quintessential example of remodeling a 1970s lake home that could be in any mountain environment. Located 80 miles from Whitefish, the house’s location boasts a view all the way up Whitefish Lake. At 3,200 square feet, its original and traditional style needed massive updating, which required gutting it to its frame. Aside from the dangerous rotting decks, there was a bigger motivation for a remodel. At the time it was built in the 1970s, there were no setbacks or regulations, and so it sat at the lake’s shoreline. By remodeling, it could preserve its footprint and original setbacks allowed by the earlier regulations. If a new home were constructed, it would require a newer location much further from the lake’s edge. The dark home, complete with wood paneling on its walls and shag carpet on its floor, had small bedrooms that were not conducive to spending much time inside. And, with cumbersome headers and moldings on the living room and dining room windows, the views from these spaces were practically nonexistent. 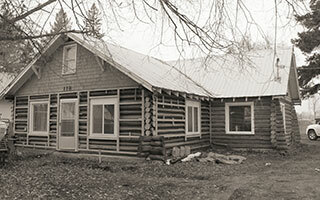 When it came time for demolition, Reedstrom and Fischer enlisted Habitat for Humanity and donated all paneling, plumbing, appliances, and other materials to their Restore program, which sells the materials in Kalispell. “We are fortunate that we have a program in which others are able to build and rebuild their homes,” comments Fischer. Architect and interior designer Randall Holman designed an open floor plan with floor-to-ceiling windows to bring in massive amounts of light and views of gorgeous Whitefish Lake. “Once the windows were installed, the contemporary design shone with loads of glass and steel. “The main floor, which comprises living, kitchen, and dining spaces, is spectacular! The first word is always, WOW!” he continues. In the kitchen, flat, sleek European-style cabinets made from figured ash were on the plan. Next up, the lighting. “Lighting technology has come so far and a varying range of temperatures were created to transform the open spaces,” states Reedstrom. “Each floor with 1,600 square feet of living space feels so much larger than before.” This home was always thought of as purely a weekend cabin on the lake. Located on the main floor, the master bedroom and bath are above the family’s sitting room, bathroom with sauna, mechanical room, laundry room, and wine cellar. A guest suite is attached to the garage. Brad Reedstrom reflects on the project saying, “We realized when we were rebuilding this home, we were building it with a multi-generational family in mind. The parents and original owners of the home enjoyed it, but now updating the home to standards and preserving it so it can be left to their daughter meant we were always thinking about longevity, minimal maintenance, and safety.” With unrivaled and dramatic views of the water from the inside, and the shoreline at one’s feet on the outside, the lake is an integral part of the home’s statement. “When you come up to Finley Point, you turn off the highway and drive for quite a while, climbing up and down through the woods. At the very end of the point is this property. You can see all the way to Glacier National Park. It’s magical,” Reedstrom claims. No doubt, memories will be made at this home for generations to come. Intrigued by the blueprints, descriptions, and timeline? Look for our next issue when we include photographs and more in-depth details of this completed project.